Eric Beers has definitely known a few ups and downs in his racing career over the past year. The Pennsylvania driver started racing Late Models at age 16 and has spent his career driving just about anything that he could get a ride in at just about any track where he could race. He’s seen action on the RoC Tour and on the NASCAR Whelen Modified Tour. He’s won the Race of Champions at Oswego. He’s won at Florida Speedweeks. 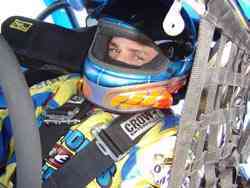 In 2002, he finished as the runner-up to Todd Szegedy for the Rookie of the Year title on the NASCAR Modified Tour. Most of all, Beers is a nice guy who is respected and liked by his fellow competitors. Therefore, when he was named as the new driver of the legendary Boehler Racing Enterprises’ #3 car in the off-season, there weren’t very many people in the pit area who weren’t happy for him. Beers finally had the chance in his career to consistently run up front in one of the best rides on the Tour. The future looked bright, but that all was in jeopardy when Beers crashed hard on lap 53 of The Icebreaker at Thompson. In the first race of the season, Beers suffered multiple injuries and the first part of his potentially breakthrough season was now in doubt. 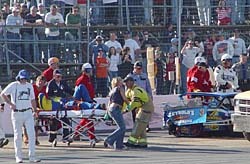 How long would Beers be on the sidelines after his crash? How far would his recovery set back his goals for the year? Those questions hung in the air in the Modified pit. Amazingly, the crash had minimal effects. Beers had to sit out the second race of the season at Stafford Motor Speedway, but Szegedy kept his seat warm with a third-place finish. Beers was back in the car for the third event of the season and showed that he was more than ready to race. He finished second at Riverhead and hasn’t looked back since. Beers won his first career NASCAR Whelen Modified Tour race at Seekonk in July and has been very consistent all season. Despite missing a race, he currently sits fifth in the point standings. Since he has come back from his wreck, Beers has only finished outside the top 10 once in 14 starts. Even Eric Beers is surprised with the success that he has had this summer. He never dreamed when he was recovering that a top five point finish was even possible. Part of the bond that Beers shares with his car owners is the fact that they were all raised around racecars. It takes a good chassis, a powerful engine and the right set-up to run up front on the Modified Tour. It also takes good people on your team. Actually, it’s more important to have the right people who can work well together. That is exactly what Beers has found with the #3 team. Beers suffered multiple injuries in this Thompson wreck. It wasn't how he wanted to start the season. Eric Beers right at home in his Modified. That common upbringing has helped Beers and the Boehler family become more than just driver and car owner.